I have a best friend named Karen. She and I met in college. We were line dancing buddies. We had some great times. We, since college, have done a lot together. Despite us being about 1500 miles away from each other. We both have three kids. Her kids are 6, 4, and 2 months. Mine our 6, 3, and 8 months. We talk all the time. She is the best. I just wish she lived closer. She lives in Ohio and I am way down south. We hardly see each other. But that doesn't keep up apart. You see we both went to college to major in horses. I know weird major. But it's a real major. I have a degree with the title of: Equestrian Riding and Training Western Emphasis. There are not a lot of jobs needing this degree when you have three kids and are a stay at home mother. So, for fun I just train my own horses. And with all the time I don't have, it seems like none of them ever get broke. Like this feller here. This is Emerald City. He is named after my friend Karen. You see they both have the same birthday, March 21st. My friend loves "The Wizard of Oz". So, we decided to name him Emerald City. I call him Ozzie for short. Ozzie is a three year old. And he may have the body of a three year old but he has the mind of a 20 year old. He is the laziest thing I know. There is a funny story behind Ozzie. 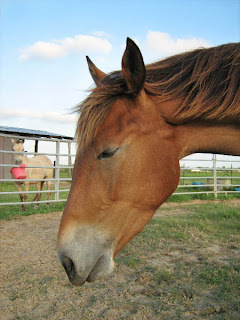 Three years ago our paint stallion, Red, jumped the gate to our mare's pasture and bred three out of our six mares. He was only out for the night, I guess it only takes one time. That is what I have heard! 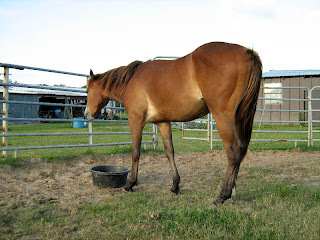 But my mare is a Thoroughbred and I did not want to bred her to a paint, I wanted another Thoroughbred. So, we gave her a shot to abort the foal. She got all sweaty and did all the things that she was supposed to do and then 6 days later she came back into heat. So, I took her to the Thoroughbred Stallion and bred her. She then went out of heat and at 18 days later she was confirmed bred. Exactly 342 days later she had a stud colt and I named him Ozzie. He looked just like his dad. But one thing didn't match, and that was his DNA. When I went to register him with the Jockey Club his DNA didn't match the stallion's DNA. I had them do it again, and it was still a negative. So, now my race horse was a solid paint. Ozzie went through some tuff times. He went through Hurricane Rita, and came out with a puncture wound in his right shoulder. At 18 months old he had an abscess on his neck that we had to drain once a day. Then at 2 years old I decided that he needed a little brain surgery. Ya know......uhm.....make him a gelding. Make him half the man he used to be. He was a crypt orchid. He had "one" up and "one " down. So, it was a long expensive process. He was so great after surgery. He let me hose him off. Then I decided to break him. I was huge and pregnant. We did a lot of showmanship and a lot of round pen work. Mr. Cowboy then rode him for about two weeks and we then turned him out in a 50 acre pasture with the cows. I did not have any more time to play with him. He stayed turned out until about 5 months ago. We brought him home and I started back of where we left off. He didn't forget a thing. I took Ozzie to an arena for his first time and he acted like he had been there 1,000 times. He didn't raze his head to look at a thing. How did I get so lucky. This horse was supposed to never exist and here he is. Ozzie, the sweetest horse I think I have ever trained. He is not the most beautiful boy. He is a funny brown color. He has wild hair that is so darn thick I am not looking forward to pulling it so we can show. 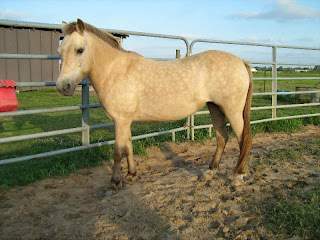 He is registered with the American Paint Horse Association. But he is solid and there are not many classes for that around where I live. 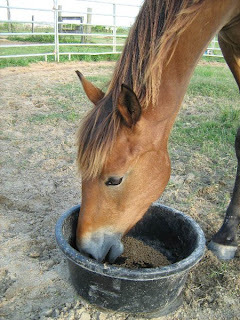 But after all Ozzie has been through he is a really wonderful gelding. Joe. Ozzie is so scared of Joe. He will walk way around him with his head down and nostrils flared. I don't know what it is but Ozzie can not stand him. I like Joe, and Joe likes me to scratch him right on the top of his hip. I swear he is like a dog! But I think Ozzie will get used to Joe. They have nothing but time, to get to know one another. And hopefully one day I will get to finish working Ozzie. I am already impressed with his ability to only have to be ridden every so often. Most colts need about 5-6 days a week. Not Ozzie. He will pick up right where you left off. I mean how many people can say they have only ridden there horse 5 times and can do counter bendig circles? Ozzie loves them. He is a strange horse. I am so glad after all he has been through he made it. I think his name suits him, Emerald City. The place of hopes, dreams, and magic. Lazy, that boy is, pure lazy! That's my boyfriend!! Hooray Ozzie! I love you! Don't let my silly sister get to you. You're not lazy, you just appreciate a good rest. And don't let the goat get your goat. He's 1/10th your size. You can take him. And if not, your horsey girlfriend can. It's okay to not wear the pants in the family. I still love you!! Ok, so I'm guessing the shot to abort him didn't work? How bout that! I love him! A sweet, lazy horse is just what I like. I bet he will make a fine western pleasure horse. That was a cute story about Ozzie. How special you named him after your friend!! I think some horses just have that great, naturally laid-back personality. They are hard to come by. He's a special horse, and it sounds like you have great plans for him! 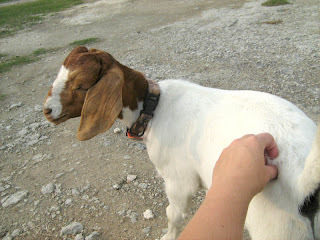 By the way, I am sure he will get used to Joe with time...I've always heard that goats and horses make great companions!